Hopefully some of these tips will help yoor hoomans cope wif any problums we mite haf. Furst up is CPR. Lifesaving procedure to save our lives. Wot evfurry hoomum and dad shud know. If we stop breathin! Act fast! 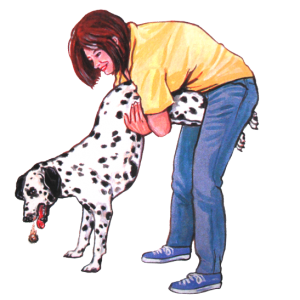 Your knowledge of Canine CPR and the Heimlich Maneuver may save your dog’s life! Most dog owners understand that Murphy’s Law is a constant and whatever your dog can do, he most certainly will do. Sometimes this canine mischief is innocent, other times not so much- and your best friend may end up in a life threatening position. It is always wise to be safe, rather than sorry; so I haz put together a simple guide with two tried and proven techniques to save your dog’s life. Immediate action can mean the difference between permanent brain damage or death and your canine companion living out his golden years by your side. I haz also listed some basic furst aid procedures for da most common fings wot can happen to our furpals to help da hoomans lurn how to care for us. The first thing you must learn about CPR (cardio pulmonary resuscitation) are the three principles, easily remembered by thinking “ABC” or Airway, Breathing, Circulation. In some cases there may be an obstruction to your dog’s airway that is the causal factor in his inability to breathe- obstructions can be anything from blood to vomit or even saliva. Regardless of what is blocking his airway you must clear his throat before proceeding. Veterinarians recommend using your index and middle fingers to swab the back of the throat as best as possible. In other cases it may simply be the positioning of your dog’s neck that is keeping him from breathing. The optimal position to inhibit breathing is to place your dog on his side, tilt his head back and pull his tongue forward. Sometimes this may immediately solve the breathing problem, either way you should at least be prepared for the worst. Hold your dogs mouth shut and blow air in through his nostrils. 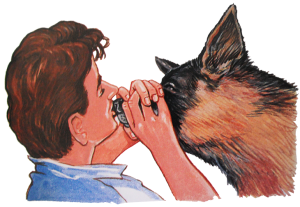 To breathe air into your dog’s lungs you must hold his mouth shut and place your mouth over his nostrils, breathe in a total of four times. You should breathe in with enough force to raise your dog’s chest. If you are breathing with enough force you will feel resistance and hear air entering his lungs. The most important step in the entire process is kick starting circulation to get your dog’s cardiovascular and pulmonary functions operating again. To circulate the blood you must first make sure that your dog is positioned correctly; he should be on his right side and be laying on a hard surface. Place the heel of one of your hands on the ribs over his heart (where his left elbow would touch his chest when bent) and then place the heel of your second hand on top of the first and push down. The right amount of pressure will compress the chest about half way to the ground, you should do this 15 times and then breathe into your dog’s nose twice. Repeat the process. The ideal amount of compressions in one minute is anywhere from 80-100. It has been proven to help if you count out loud – e.g. “one and two and three and four”. Remember the song 'Staying Alive' and sing that to yourself as you're compressing the chest. It is recommended that you continue CPR on your way to the vet, continuing CPR for 20 minutes until your dog is able to breathe on his own. 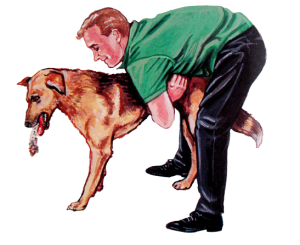 In the unfortunate instance that your canine friend finds himself choking your immediate and knowledgeable action can save him from permanent brain damage or asphyxiation. Pay close attention to the techniques below in case you need to utilize them one day. The first action you should take is to attempt to dislodge the obstruction that is causing the choking. If your dog is a larger dog you first place your arms under his belly and slide them back until they are just in front of the hind legs (around the groin area), secondly you must lift his rear legs while leaving his front legs planted on the ground, after you have done this the next step is to firmly shake your dog. For simple toys and other chewed items this should do the trick and dislodge whatever was obstructing his airway. Alternatively, if you own a smaller dog follow the first step mentioned above but instead of lifting his hind legs you should lift him off the ground in the upside down position and commence the firm shaking. Once you have placed your arms below the last rib give a forceful squeeze. 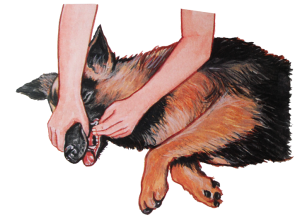 If the first technique does not solve the issue your next action (if your dog has not fainted) is to perform the Canine Heimlich Maneuver. If your dog is standing you must tightly wrap your arms around his stomach just under his rib cage and give a quick, forceful squeeze. The majority of the time the item disrupting airflow will come right out. In the event your dog has fainted you can still help him! Place him on his side and feel for his last rib near his stomach- place both hands, palms down just behind the last rib and firmly (but quickly) press down a couple times. It is important that if neither of these techniques do not work you must immediately take your dog to a vet! So now yoor hoomans know how to save yoor life if yoo stops breavin. Now for some furst aid tips for dem. When your pet has an emergency, being prepared is very important. Before an emergency strikes, be sure you have your vet's contact number easily to hand and have a plan of how you will transport your pet to the surgery. You can also stay prepared for emergencies by putting together a first aid kit for your pet. You SHOULD NOT get on-line during a pet emergency or when your pet is seriously ill. In an emergency, first aid is not a substitute for veterinary treatment. However, before you are able to get your pet to a veterinarian, knowing some basic first aid can help. Always seek veterinary care following first-aid attempts. There are all kinds of ways that your dog can get cut, scratched, or otherwise suffer injury to their skin, both around the house and outdoors. Vetericyn, for example, is non-toxic, won’t sting, and is designed to clean and speed healing. If your dog suffers a serious laceration or other injury, you’re probably going to want to cover it with a bandage after using the wound spray. Look for self-cling bandages that won’t stick to your dog’s fur to avoid painful removal later. Unless you want Fido looking like a mummy when you bandage him, include a pair of bandage scissors in your kit that are designed to cut through gauze, clothing, and (yes) bandages. If your dog gets some kind of pollutant or other contaminant in her eyes or ears, it can cause itching, stinging, burning, or worse. Dog-safe eye wash and ear wash can help you flush out the problem materials with a dropper nozzle and can even be used on any dressing needed. The problem with eye and other head-related issues is that your pup is going to do whatever he can to scratch and rub at the area with his paw. Prevent this from happening by using a dog cone, which will also prevent your dog from being able to chew at stitches from surgery or lick at a hot spot during treatment. Your vet may also refer to this as an Elizabeth Collar, or e-collar for short. Even a normally calm and balanced dog may lash out when injured, and he may also bite at a wound, making it worse. Muzzles, like the Funny Muzzle, serve the dual purpose of keeping a nervous or aggressive dog from harming others or bringing harm to himself. The leash is an important tool to have on-hand because it’s a way to gain control of your dog at a time that she might be panicking and try to run away. You want to be able to focus on the injury, not just keeping your dog from fleeing. You can add to these items with things such as antihistamine tablets (human brand is fine), eye dropper etc. Poisoning is a pet emergency that causes a great deal of confusion for pet owners. In general, any products that are harmful for people are also harmful for pets. Examples include cleaning products, rodent poisons and antifreeze. But you also need to be aware of common food items that may be harmful to your pet, such as grapes, chocolate, some house and garden plants etc. So be aware of what is harmful. Forewarned is forearmed. Use the Heimlich Maneuvre mentiond above. You may not have time to get your dog/cat to the vet so you need to know how to perform this to save it's life. It's very helpful and well written. But We give you friendly-looking, comfortable with a perfect fit of dog muzzle.